Bird Watchers, What a find!! we are avid bird watchers and found this place to be one of the best locations we have ever visited. We also love to walk but as the years are now catching up on us don't like it to be too difficult. We feel we have really landed on our feet in Vinuela and guess what - we will be back, thank you Isa. 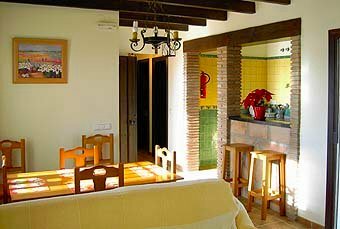 The lounge diner is spacious with American breakfast bar opening to a well equipped Andalucian modern kitchen complete with Ceramic hob, fridge,freezer, microwave, washing machine, extract system and all pots / pans etc. The lounge also opens onto a private terrace with the most spectacular views of Lake Vinuela and the surrounding countryside. The terrace is well furnished for al fresco living with patio table and chairs plus barbecue. Children love this area which offers so much freedom to play and express themselves. 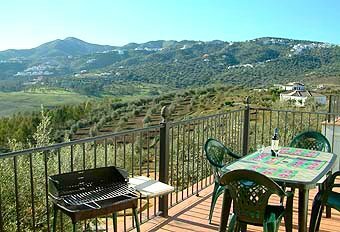 From the terrace of the accommodation parents can supervise from a distance while the children amuse themselves in the swimming pool or on the grasslands below which are dotted with Mediterranean pines and olive trees. 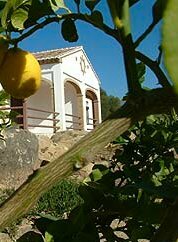 From the villa you can book guided tours and mountain bikes whilst nearby there is golf, tennis, hang gliding Quad Biking (silent battery driven), rock climbing and abseiling. The lake is popular with windsurfers during the summer months and anglers the whole year round. A fishing licence from your own country will enable you to acquire a temporary permit whilst on holiday. Lake Vinuela is well stocked with Carp, Trout and Bass. Shopping is easy in the local villages or 10 minutes away in the very Spanish town of Velez Malaga. Here apart from the usual small shops there is a very large modern shopping complex with multi screen cinema ( 2 in English) and a brand new 15 lane bowling alley. Restaurants are plentiful with something for every taste and pocket. A car is essential to enjoy this area to the full. sleeps from 2 to 6 persons. 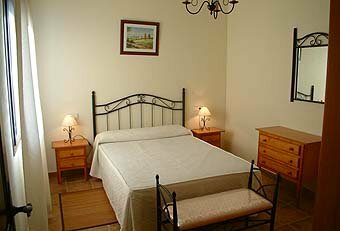 Prices charged are in Euros for the villa per week based on 2 persons sharing 1 bedroom. For extra bedroom please see the supplemental rates. Please note that in July and August the rate is for 4 persons (min charge). For extra persons please see the supplemental rates. Deposit: 25% is payable to confirm the reservation, the balance to be paid 6 weeks prior to arrival. Payments by transfer to a Spanish bank account. Details to be advised at the time of reservation. 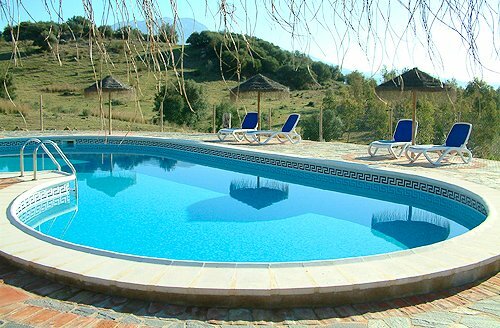 On a small development of only 8 properties on the North Eastern shore of Lake Vinuela in Andalucia, this newly built villa is perfect for a peaceful vacation. 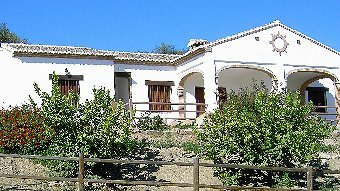 Only 10 minutes from the beaches of Torre del Mar on the Costa del Sol this is a wonderful setting. In front, grassy slopes and walking tracks around the lake - and behind, the wonderful hills of the Axarquia. The following are just a few of the comments left in our visitor book by recent guests at the property. We hope you will enjoy "Alojamientos rurales Huetor" just as much - please ask if we can help with any of your holiday arrangements in Spain such as car or cycle hire. Great Vacation, We stayed the last week of July at Huertor and it really is very recommendable. Photos and features on the internet accurately reflect reality. I think the situation of the house is ideal to spend the hot days of summer.Only half an hour from the beach and breathtaking scenery. The children enjoyed the pool like never before. The attention of the owners was excellent. We will return. Fantastic weekend, The ideal place to disconnect and relax in comfort with the facilities of a delightful house and enjoy its wonderful views. 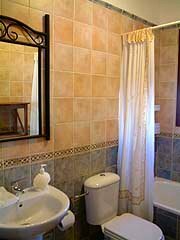 All you can expect from a country cottage and more, the site, the house, its facilities, cleanliness and quiet make Isa's Rural Huetor deserve 5 stars.